4 foods to make you feel frisky. Arouse more than just your stomach this Valentine’s Day. Caution: eating all at once could cause extreme levels of friskiness. Here’s some food for thought, sweets; avoid the food baby this V-day dinner and opt for frisky feelings instead. I’ve put together a 5-star menu to turn on your stomach – and your senses. First on the menu, oysters. Some babes squirm, others swoon. All I know, is that these little mouthfuls get your love hormones pumping, and who doesn’t want that? Take it from love expert, Casanova, who ate 50 of them for breakfast each day. Add a little fire with some chillies. Need some turning on? These fiery beauties stimulate endorphins (your brain’s excited chemicals) leading to feelings of spice and desire. It’s no coincidence that they’re the colour of love either. #letsbefrank. We go together like avocados go with everything. Who doesn’t want a bit of guac to get the love juices flowing? Avocado has Vitamin E for energy levels, so you can go all night long. Just add lime, señorita. And finish with some chocolate. Now, I know you don’t need convincing. This is probably the most notorious inducer of ooey-gooey feelings. 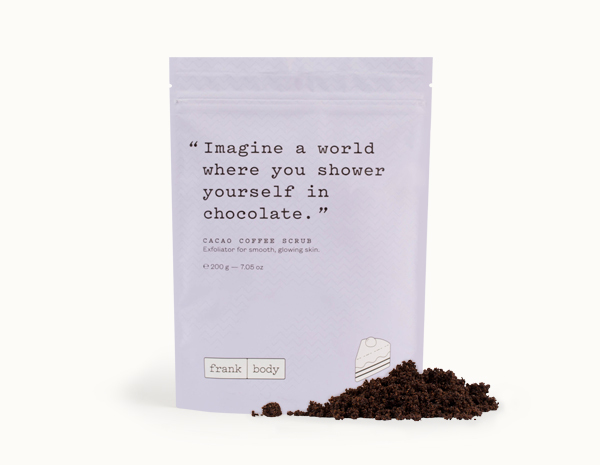 Just like my Cacao Coffee Scrub, chocolate increases your feelings of euphoria. And when you’re happy, I’m happy. That’s four courses of friskiness right there. The fifth? Read my kissing guide. Remember: couples who scrub together stay together. Tag your success on social.